OneRestore Tile & Grout cleaning restores your tile surfaces to look just as they did when they were new. With our cleaning system there will be NO residue left in the grout or on the tile that will cause re-soiling. After our OneRestore technicians professionally clean your surfaces they can provide recommendations on how to maintain your tile floors and preserve the clean, smooth finish, with no residue cleaning in the future. Our system not only removes soil build-up and grit, but our optional sealer also prevents soiling and stains for years to come. Ultimately our cleaning system will leave your surfaces more hygienic and clean. Creating a clean, chemical-free environment for your pets, children, and family, OneRestore uses green technology that safe-guards your home and everyone in it. Because grout is made from sand and sand is porous, once it has been applied to our tile and has dried, it is ready to soak up any fluid that comes its way. It is important to penetrate the grout with sealer in order to get one step ahead of the moisture. Our color grout seals last five to ten years, have a five year warranty, and our clear grout seals typically last up to three years with a one year warranty. However, we will be happy to reseal your grout if your seals are damaged within the time frame that the warranty allows. Sealing your grout and filling in the grout line voids, leaves you with a smoother surface and makes your tiles easier to maintain and clean. Available in over 100 colors, the color seal has the ability to not only provide your grout with the absolute longest lasting protection, but refreshes heavily discolored grout to look like new again and help keep it looking that way for many years. Although tile floors are extremely tough, occasionally you will have a tile break due to moving a heavy item like a stove or refrigerator, a fallen object, or your home settling. As the grout grows older, often times it will fall out or discolor. We understand that your surface won't look great with missing grout or those broken and cracked tiles no matter how clean we get your tile and grout. 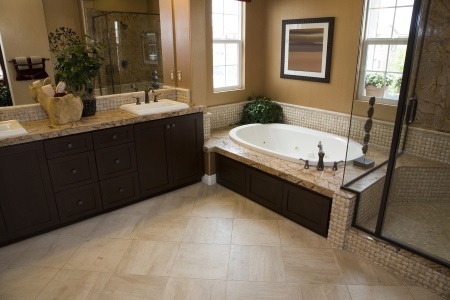 That is why, in case of incident, we additionally offer a tile and grout repair service. OneRestore replaces your broken tiles and fills in any missing grout to make your tile surface look just as they did when they were brand new, and often times we can fix your damaged tile or grout simultaneously as we clean.